The small village of Sougia on the south west of Crete has so much to offer to every traveler that is an on earth paradise. It has managed to remain unaffected by all the tourist vague of the island of Crete and it has somehow maintained its original character. This doesn’t mean that you are not offered only the best accommodation hotels and the best food at the traditional taverns and restaurants with only the most amazing famous Cretan rustic flavors. The touristic season begins in early April for Cretans that love to welcome visitors from all over the globe eager to see the island’s beauty. The beach is the ideal choice if you are looking to relax and enjoy the sun and sea. This amazing village is a top choice for visitors from all over the world and you will see that visitors are coming back to Sougia to experience amazing moments. 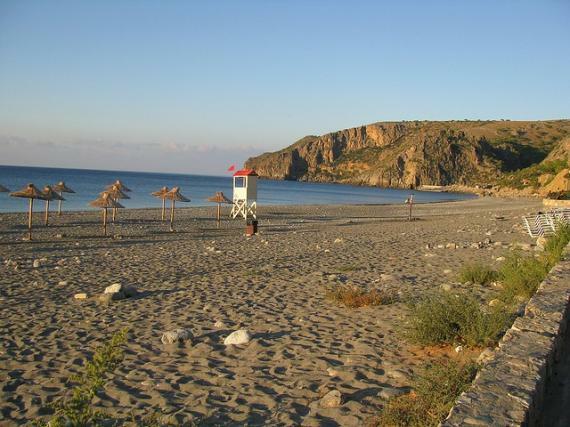 Stretching over 1 km, the beach of Sougia is the longest beach in the South-West of Crete and is 1,2 km long. Some unique characteristics of the beach is that nudism is tolerated there and more importantly you are invited to embrace the real you in the most amazing part of Crete of diverse beauty. Built in the ruins of the ancient Syia where mainly in the Roman and first Byzantine period people lived, you will find today a variety of Byzantine churches from the 11th and 12th century taking a trip back in time giving the area a unique character. There are many ways to get to Souda like by boat from the Chora Sfakion and Palaiochora or by car from Chania to Sougia (70 kilometers southern from Chania) and is really worth all the way! The remoteness of Sougia invites you if you are seeking for peace of mind, quietness and relaxation to choose isolation over the hustle and bustle of the tourist resorts. Find information about selected Hotels, apartments and rooms in Sougia to choose the perfect place for your accommodation.